Hidden city ticketing is a strategy some fliers use to reduce their airline ticket price, by taking advantage of cheaper airline ticket pricing to non-hub cities. If you fly into or out of a major captive hub city dominated by a single airline, such as American’s Dallas Fort Worth hub or United’s Chicago hub, you’ll often pay more than if you were on a ticket that connects in that city but has another city as its destination. LA is a major hub, and you can see the effect of this even on a simple economy one way between San Diego and LA, which can easily run to almost $300. 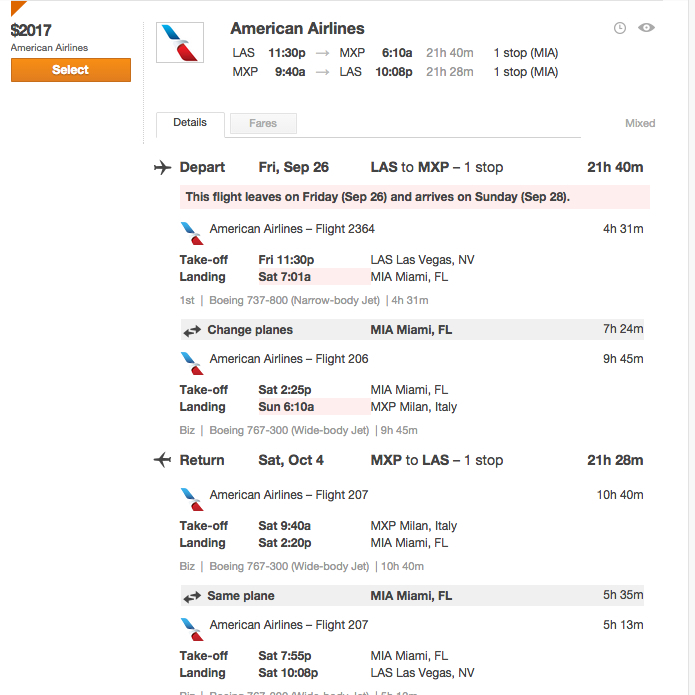 If you instead route via LA to Las Vegas, you can get a nonstop for just $85, in this example. 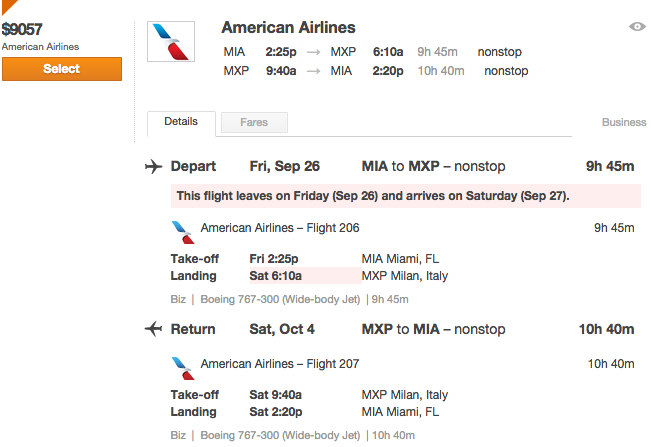 If instead you bought a roundtrip business class ticket from Las Vegas to Milan via Miami, including the same MIA-MXP flights, it’s just over $2000 (which can be further reduced for AARP members, who can get $400 off business class fares booked by October 14 and flown by March 31, 2015). That would mean a ~$1600 business class roundtrip to Europe, if you use the AARP discount (you do have to be an AARP member, but membership is inexpensive, and is open to adults of all ages). 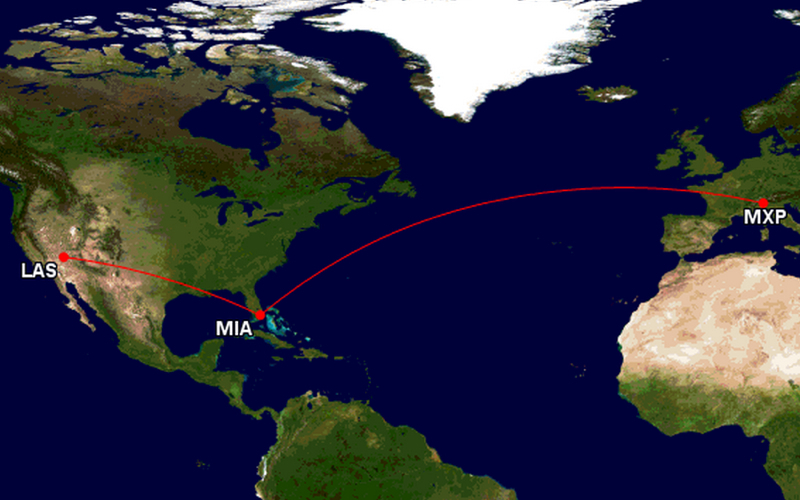 While this particular deal is a temporary one, from some Western U.S. cities to destinations such as Milan and Amsterdam, and only works as a roundtrip, it could be worth it for some folks in the connecting city, in this case Miami, to book themselves a one way to Las Vegas, then fly the trip and throw away the last segment of MIA-LAX on the return. 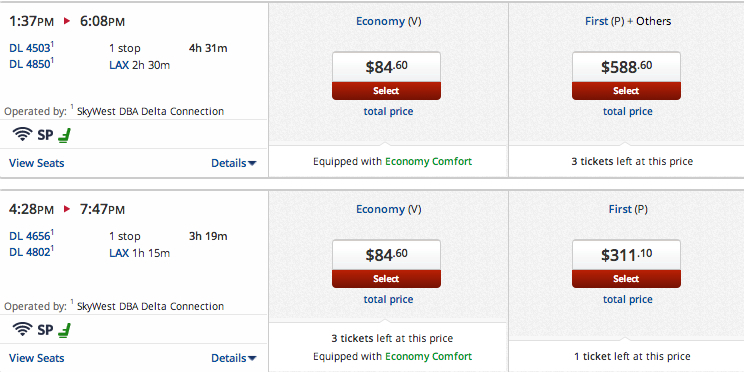 Even with the one way, you’re looking at over $6500 in savings thanks to hidden city ticketing, just by flying from another city and connecting through Miami, instead of originating there. If you have significant frequent flyer miles and/or elite status with the airline you’re planning to use for hidden city ticketing, you should be aware that there’s a small chance you could have your frequent flyer account closed and lose your miles. That risk of course increases the more you engage in hidden city ticketing, especially on the same airline, within a short period of time. Along the same lines, it’s possible the airline could ban you outright from its flights, most probably if you’ve been a signficiant abuser of hidden city ticketing. Most travel agents won’t assist you with ticketing a hidden city itinerary, for the very real risk that they could receive a debit memo that requires them to pay the difference in fare between the itinerary you booked and the one you actually flew. If for some reason your original flight is changed or cancelled by the airline, and you’re rerouted, you could end up not flying through your original connection city that you planned to deplane at. Book One Ways or Don’t Fly the Last Segment: Remember that any unflown segments will prompt automatic cancellation of the rest of your ticket. So hidden city ticketing or throw away ticketing only works if you don’t fly the last segment. Don’t Check Luggage: While some folks do have luck with short-checking baggage, I wouldn’t count on it. Instead, fly with hand carry luggage only, and travel especially lightly so that you don’t run the risk of being forced to gate-check luggage, since that luggage will go to the final destination instead of where you plan to deplane. Don’t Involve a Travel Agent: Debit memos are a very real risk for travel agents, so please don’t try to involve a travel agent in a hidden city ticket. If Asked, Tell the Truth: As Nate Silver points out in his article, while hidden city ticketing is not illegal and you won’t be prosecuted for it, you could get in serious trouble for lying about what you’re doing. So if you are questioned, it’s important to tell the truth, so that you don’t wind up facing fraud charges. Have you used hidden city ticketing to save on airfare?